What fuels the nightmares of the mountain folk? Today’s Dread Ghoul template also brings us the Ghoul Lord Frost Giant sample creature: "A blight on the frozen lands, a ghoul lord frost giant fills the same role with the dead as a frost giant jarl with living giants. 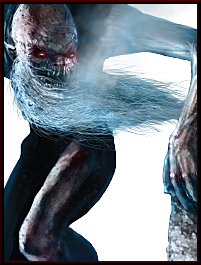 Ever hungry, the giant and its undead minions raid local villages and towns, leaving nothing but blood on the snow." Download the Dread Ghoul template and monster for free!